David Higgins knows how to take his 2012 Subaru WRX STI Open Class rally car and get the most out of it on a road course. After all, he leads in the 2012 Rally America Championship standings and won the 2011 Rally America National Championship after racking up three event wins and five podium finishes in six events. 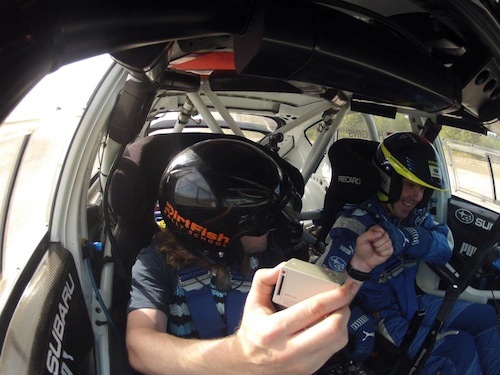 Shon Bollock, Subaru owner and GoPro extraordinaire, wanted to see what it’s like to ride shotgun with Higgins at the DirtFish Rally School near Seattle, WA. The DirtFish Rally School is located on 315 acres of prime terrain that offers an incredible venue to drive a fully modified 2012 Subaru WRX STI. The track has been described as “a skateboard park for big kids.” Now that sounds like a great place to video David Higgins driving the snot out of the Subaru STI rally car. So the pair strapped on their race helmets, buckled up their race harness and took the ride of a lifetime. In the 3 minute video below, Higgins takes the WRX STI and drives it through a tree-lined course that would scare the socks off anyone. If he makes one small mistake, it’s over for both he and his passenger. Higgins is the best all-around rally driver on the planet and not just anyone is capable of projecting a car at these speeds through a tree-lined course. For those who want a taste of rally driving and feed your passion for adventure, excitement and competition, the DirtFish Rally School, where the video is filmed, is open to the public. The DirtFish Rally School has rally driving programs for everyone from rookies, to competitive racers. The folks at the school say, “you’ll have an experience that will fill your heart with joy, your nether regions with excitement and the rest of you with dirt.” Sounds like a pretty cool way to spend a day. Whether you want a two-hour taste, a half-day intro, a one-day fundamentals or a three-day advanced rally-techniques program, it’s all there for thiose adventure-seeking individuals. You can contact the DirtFish Rally School at www.dirtfish.com, or call 1-866-285-1332 for more information. But for a fun ride that will take your breath away, watch the video below as David Higgins and film maker Shon Bollock take you for a fun-filled ride in the 2012 Subaru WRX STI rally car. The music is from Ellie Goulding as she sings “Hanging On.” The STI is an amazing machine.